Do you have to juggle writing while raising a family? Families don’t get in the way of your writing; they just complicate it. If you allow kids and a spouse to convince you they’re in the way of your writing, then not only will you be bitter toward yourself when you want to write (because you’re not spending time with kids) but you’ll also be bitter toward your family when you’re with them (because you’re not writing). Instead you need to treat writing like an extra kid that deserves time and love of his own. 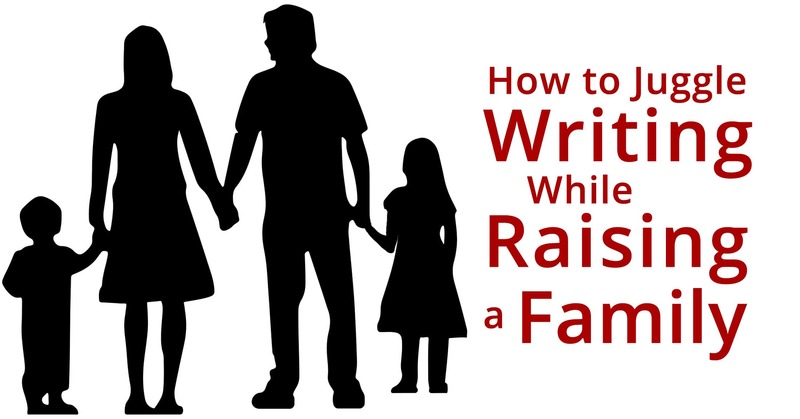 Writing needs to become part of the family, and the more it does, the more support you’ll get from your kids and spouse. Here are just a few ways to write and include your family in the process in order to juggle writing while raising a family. Sometimes the most obvious suggestion is also the most annoying because you’ve heard it time and time again. However, how can anyone say that setting goals is a bad thing to do? Most people who scoff at setting goals have either never set goals before and so don’t think they’d benefit from doing so, or have had a previous experience where set goals were not met and actually seemed to prevent writing from happening. Don’t let your previous experiences goal-setting keep you from new goals now, especially if you have a family. Writing goals for your writing and posting them around your house not only burns these goals into your mind, but it allows your spouse and kids to see your goals and know that you need time and extra help from them to help you meet them. Remember, if you’ve got a family, those goals don’t have to be a one-person mission. When you have people behind you who can do more around the house, pick up groceries, clean more, and get the kids to bed, you’re allowed to ask them to do so in order to help you achieve your writing goals. Additionally, make sure these goals are specific. Many writers give themselves a daily word count (like 1000 words a day) and this goal often reflects how much free time the writer has outside of family matters. If you only have time for 200 words a day, then 200 words a day it is! Write these goals down as statements using “I”: I will write 1000 words a day; I will finish a sentence before I get up from the computer to change a diaper. If your spouse and kids don’t know about your schedule and don’t see it hung around the house, then they won’t care or even really understand when they’re interrupting your writing time. Whereas if you make a schedule that outlines not only time for you and your family together—chores, rides, school, dinner, etc.—but also time apart from the family for your writing, they’ll begin to understand that writing is not just “fun time”; it’s also a job. Just as parenting is a job, writing is a job, and almost any job you’ll ever work has set hours and a set schedule. In making the schedule, decide what time of day will be the best time for the most writing. Actually sit and plan with the family so they know you’re serious and they know you need your own time like any human being. After you’ve scheduled your writing time, keep to it. This is very important because if you’re flaky and don’t keep to your schedule, then your kids won’t take writing time seriously and will start bugging you when you’re busy. Barring emergencies or special occasions, you should never miss your job. Otherwise you’ll get fired, right? After three times of missing your writing job, fire yourself. Rehire yourself immediately and begin again, but understand that writing time is for writing! It is not optional! Don’t plan other things around writing time, don’t socialize with friends, attend church activities, clean the house, exercise, or make any other writing time sacrifices. If you do sacrifice, sacrifice in favor of your writing. Remember that the best times to attend your writing job is while your kids are at school, early in the morning, or after you’ve tucked them all into bed. First-time Mothers, Fathers, and Babies! First of all, babies, stop bothering your mothers while they’re writing! Be happy with those binkies in your mouths! Don’t ask for more food for at least another hour! And at night cry for Daddy instead of Mommy. Unless Daddy is the one staying home and having writing troubles, of course. Only break your schedule in favor of writing! You’re a parent and a writer, which means you should not only schedule, but you should cheat and also write at times where you aren’t scheduled to be writing. If you suddenly get a free moment that might last a while, force yourself down into that chair and start writing! Write as long as you can before you’re interrupted or people notice you’re missing. Love both your family and your writing. This isn’t blasphemy, so long as you remember that you’ve got enough love and time in your life for your spouse, kids, and your writing. There isn’t some limit on love and time you can spend to show progress in writing or give quality time and love to your family. So long as you schedule and let your family be a part of your writing and writing process, they’ll not only encourage you, but they’ll also understand when you’re busy. How do you juggle writing while raising a family? We'd love to hear in the comments below! Reuse notice: Non-commercial users, feel free to print out How to Juggle Writing While Raising a Family for personal use or give to friends, share online, or make a meme of, as long as you attribute and link back to us. Commercial users, you may share a link to this post or quote a short excerpt from it with attribution and a link to this site, but you may not use this post in its entirety. Thank you for caring about copyright.